I've had a hard time coming up with anything to write about Nixon in China at the Met a couple of weekends ago. It's such a rich and intellectually unusual opera that trying to explain it would be a sprawling task. Experientially, though, it's just an electrifying delight. The way Adams's vocal lines invest Nixon & crew with so much personality by teasing out a densely poetic, unpredictable libretto is a minor miracle. Sparks fly at seemingly unlikely bursts of words: Nixon's exclamatory "News! News! News! News!" 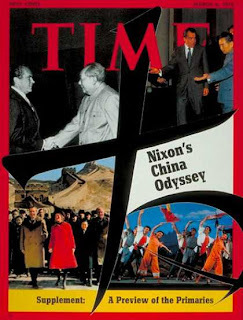 first and foremost; Chairman Mao repeatedly spitting out "Founders come first, then profiteers" like a crazy old man to a baffled Nixon and Kissinger; Pat Nixon's dreamy "I think what is to be will be in spite of us" skipping effortlessly over a couple of simple chords. The libretto (by Alice Goodman) makes fairly fascinating reading on its own, often with a strikingly different tone. The opening ten minutes are pretty much iconic for the Adams lover: The chorus of Chinese workers' "The People Are the Heroes Now" sets up the landing of Air Force One -- a cutout of the plane is lowered onto the back of the stage, in a good-natured bit of puckish abstraction, while one of Adams's great orchestral passages churns away -- and soon enough you've got Nixon's aria about the news. The whole opera, well, it's hard to take in all in one gulp. They more or less assume that you know the outline of the trip, the basic profiles of the players, and (not essentially but very helpfully) a working knowledge of The Red Detachment of Women, which is extensively parodied to fantastic effect in Act II (climaxing when a Cultural-Revolution-symbolizing riot breaks out around a coloratura soprano majestically belting out "I am the wife of Mao Tse-Tung.") Shortly before then, about at the halfway point of the opera, the thus-far literal storytelling unravels into things much more surreal and indefinite, and the entire third act is more or less a plot-free meditation on old age and the limits of human endeavor, themes that don't really exist in the first two acts. So you need to work to "get" it, or more precisely to apprehend the thematic contours of it and embrace its unexplained business along with the rest. Adams conducted the orchestra, and Sellars's staging is the opera's original 1987 creation, and James Maddelena sang the Nixon role he created back then too. So it felt like a valedictory production, and one that will be the standard until such time as another generation picks it up. And the opera has a good a shot at staying power as anything else in the newer repertoire. Right after the smog of early February's Super Bowl obsession cleared, it hit home how much I'd been looking forward to the performance -- Nate & I got these tickets back in August -- and that anticipation's paid off into a satisfaction that feels like it'll last a while. These are the highlights of art appreciation, the events you remember something about for years. So, yeah, good times all around. Had a great weekend with Nate & Kyle around to hang out with Maddie & myself, too.